Adam: Listening to the new Shins record. They sound profoundly lost. Just me? Interesting question, because of the word “lost.” Are they profoundly lost, like an artist finding great meaning in his personal state of drift? Or, as I get from the context, not able to achieve great art, to a profound degree? Are they lost themselves, lost in a sea of bad choices, or simply lost to Adam? I would suggest, from a few quick listens to Port of Morrow, that The Shins are found, both to themselves, and in a bad way, to Adam. James Mercer, who IS The Shins is confidently exploring his distinct sound with precise attention to detail, quite obviously himself, if to an augmented degree of production which might drive away a devoted fan. Mercer’s got to be happy with this album. The synthesizers which hazed away in the sweet muddiness of Oh Inverted World, (an album which as a whole drifted like the rainbow in a spray off a sprinkler on a bright summer day; hey, The Shins lend themselves to such precious descriptions) now blurbscillate like dribbles of sauce on the plate at a high end restaurant. The guitars strum along beatifically, and then pierce through on perfect little solos. His singing has never sounded stronger, especially on the high notes. Familiar melodic twists join new poppy inventions, to good effect. Whether you like that effect is an opinion I’ll never be able to shape. Is James Mercer finding his desired manifestation lost on our some-time fan? No, The Shins are found, but they’ve already been found, and what is found can not be found again. Mercer cleaned up his sound on Chutes Too Narrow, the one trick he could realistically pull without completely reinventing himself. Broken Bells might have been an attempt at reinvention, but this is definitely The Shins, and you can’t rediscover them. You can certainly say, hey, this is too clean, too produced, and while I’d argue that while every bleep might not be necessary, almost all the choices serve the songs, which (unlike on the nearly forgotten Wincing The Night Away) I’d have to say are rather strong. Note: The most in your face epicly souring songs are front loaded, and it gets gentler, possibly more appealing to suspicious Shins fans (one of Elvis’s greatest later songs) as the album progresses. Strong enough to make us forget Chutes Too Narrow? Let’s not get crazy. Someone else could find this record, and easily make it their favorite, only to find Chutes too familiar, though I doubt it. That’s one hell of a record. 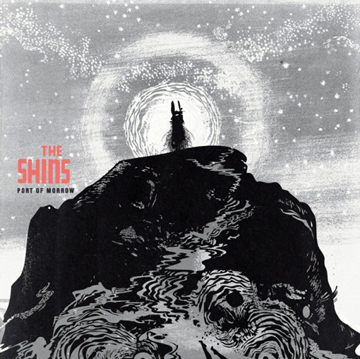 A more likely scenario is for someone to love this record, be told by Shins fans that the real deal is Oh Inverted World and then be disappointed by the lack of sonic distinction. Sacrilege? Yes, but it happens all the time. Still, while there is a proper order to getting Shins records (first, second, fourth, and you’re done, so far), I have no idea yet whether these songs are going to stick with me as long as those others have, or whether we should be making mandatory Natalie Portman references here. All I know is that I’m singing some of the tunes already, and the title track is a spooky cool thing indeed. Inevitably, getting more Shins dilutes the pool, however fresh the water. Questions arise: Is it too slick? Is Mercer too precious? Does any of it make sense, lyrically? Does the guy have to talk so much about how he’s cursed with an open heart? Could they show more darkness, edge, rock more? It’s the way with all artists. Few (The Beatles, The Pixies) have finished their runs with near perfect output. Let’s use Liz Phair as a model: she found the sound she wanted, and lost her fans (while actually charting) I’d say this album is more analogous to WhiteChocolateSpaceEgg than it is to Liz Phair. Don’t know who Liz Phair is? Maybe you should find her. Exile first, please! Back to The Shins. I think this is a singular songwriter, one we’ll be talking about for a long time. Somehow Paul Simon comes to mind, another gentle soul who spun beautiful, convoluted necklaces of song. I’m glad he’s found what he’s found, and I found Port of Morrow quite charming. If you get all your information (and unfortunately, so many of you do) from the BBC, you have a highly prejudiced view of our entity. We have been painted as genocidal robots, as the nemesis of goodness throughout the universe, throughout space and for all time. Why are we so portrayed? Is not your current modern society built on the sins of former conquerors you barely acknowledge? Are you native born to your land, or are you the offspring of conquerors, or the offspring of those defeated, seeking new homelands? If our history is marked by the defeat of primitive peoples, are we so alone in this darkness? Why are we singled out and reviled? The likely reason we seem so much more alien than even your wildest imagined aliens is that we are so obviously a hybrid of the organic and the machine. Here too we are not so unique. Look at the paper in your hand. You are reading. Your mind is silently making these words audible in your head, yet it is not conjuring the words itself. Your mind, your eyes, your hands are all interacting with marks on a piece of paper. Ever since Guttenberg, the word has not only become life, it has become device. Is there a computer in your pocket? How to you know the time? Machines! Your knowledge is warehoused in great buildings, spun out on a digital cloud. Moreover, you have harnessed the fibers of plants, animals and plastics to protect your skin. You hoove yourselves with hardened rubber, and when that isn’t enough, you roll along on wheels. And when you kill, you do not claw, you stab, you shoot, and you drop bombs with robot drones. So my bionic friend, welcome to our fraternity. You might think you’re still far enough on the animal side of this split to call us other, but your cars, trains and planes look everyday more like our metal shells. 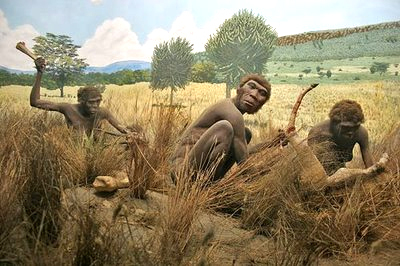 Soon you will drop your hypocrisy, and embrace the evolution which began the first time a monkey grabbed a stick. You will transcend your animal boundaries, stop digging in the ground and take to the stars. 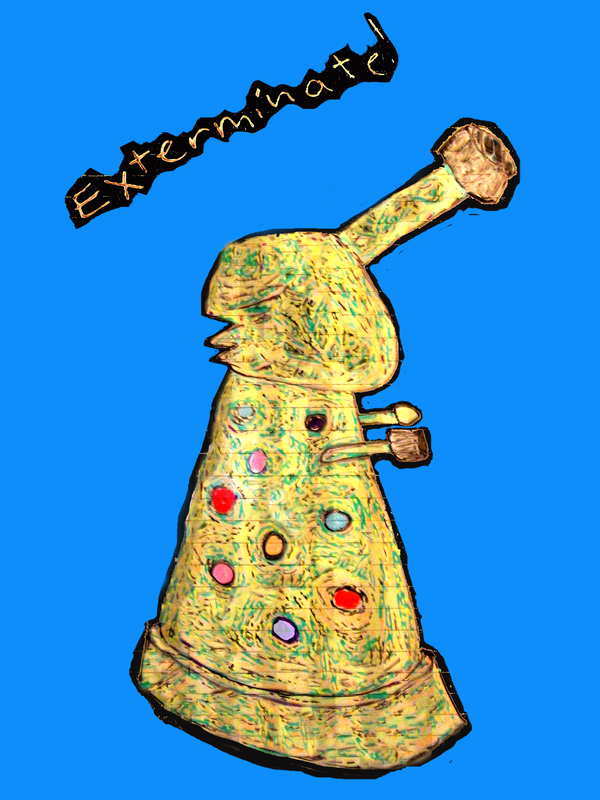 Which is why you must be exterminated. This was the program to the 3/22/12 show by The Ks. 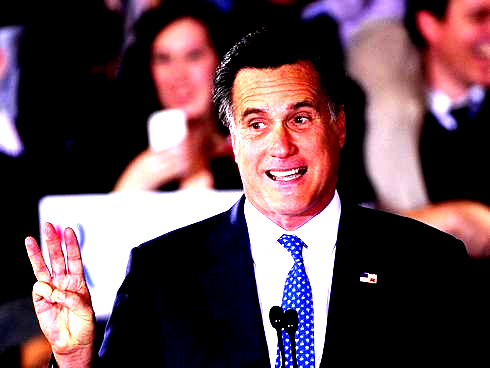 What happens when Mitt Romney smokes weed? He gets hiiiiighfalutin. When Mitt Romney does Angel Dust, only the finest Maroni will do. The Mexican Annexation Youth Organization (M.A.Y.O) is a subset of the Mexican Annexation League (M.A.L. ), a society dedicated to the friendly conquering and subjugation of the lands and peoples south of the U.S. border, rightfully belonging to the United States of America as befits the laws of Manifest Destiny, with a focus on young people. “Build that dang fence.”; “Voluntary Deportation”; “Genetic Code Identification”; “Legal Residency Status Papers”; “Amnesty”–all these loaded terms signal half measures and abject surrender to the domestic problem of our times: Illegal Immigration. Members of the Mexican Annexation League, or M.A.L. would suggest that we have the problem all backwards. The problem isn’t Mexicans wanting to be Americans, but rather that Americans are still Mexicans! If we made every Mexican an American citizen, the illegal immigrant population would be decimated, and we would have amicably conquered a one-time enemy and nuisance! With the implementation of work vouchers to allow former Mexicans to perform their tasks at wages they’re accustomed to, we could have our fajita and eat it too, all while spreading our borders as we were ordained by our Lord to do in 1776. This branch of M.A.L. 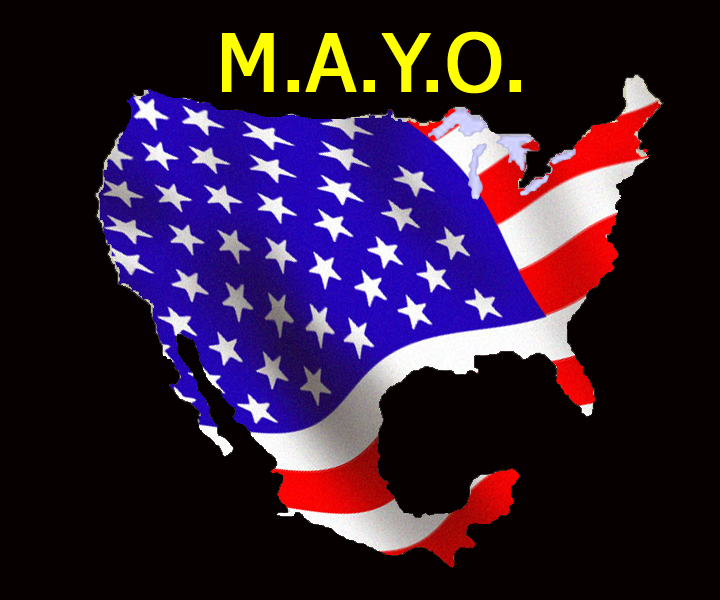 is M.A.Y.O, the Mexican Annexation Youth Organization, focused on preaching the wonders of Manifest Destiny to a hip young demographic. What could be more rad than more land for the U.S, dude? Right on! Our current project to reach young minds is a rock concert celebrating Mexico’s May 5th independence from vulgar French dominion. That’s right! Those sneering elites from Crepe-land kept Mexico under their imperial boot, back in the day. It had nothing to do with us! What better way to celebrate Mexican independence than through a night of song dedicated to the eventual annexation of Mexico? In tribute to the May 5th revolution, we’re holding our revolution on the same date, at the Local 269 on Houston Street in New York City. This event will feature five of those def young rock and roll acts the kids today so love. AMLow, Red Datsun, The Ks, Les Sans Coulottes (playing authentic Mexican music! A cross border cultural exchange!) and James G. Barry. We call this company of singers the Sing Co. of M.A.Y.O. Patriotic citizens all, or in the case of Les Sans Coulottes, patriotic citizens to be! How awesome is that, kids? Follow M.A.Y.O. on Facebook! All the kids are doing it! Wertwoo: Anything signaling cloyingly-cute or overly-quirky comedy. The word is onomatopoeic in origin, suggesting the comical flute music played in old school comedy or the humorous closing of a Star Trek episode. It’s usually adjectival, but can also be used as a verb. Hell, make it a noun if you like. It’s a friggin’ made up word, after all.